Tech’s 2016 Build Team. Builds from the previous two years are exhibited in foreground. The team has more than doubled in size since the club began five years ago. Many old motorcycles and mopeds have been generously donated. 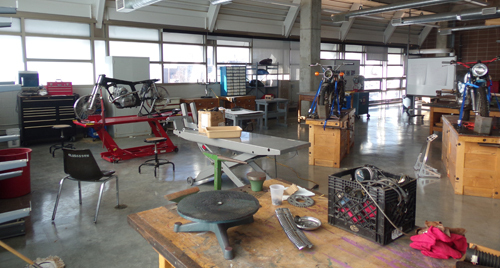 More than four motorcycle lifts are now being used, with frames, and motors stored on workbenches nearby. 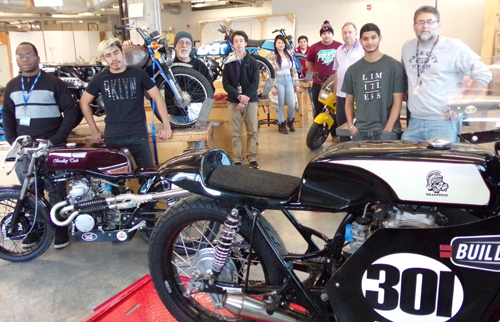 This year the team is competing with four other Milwaukee-area high schools and has less than five months to redesign and build a motorcycle that meets the standards of the American Historic Motorcycle Association and can be put on the track at Road America in June, 2016. The 2016 Build Team meets every Tuesday after school. Build was founded Tim Dixon, owner of the Iron Horse Hotel, in 2011, who envisioned bike-building mentors in a collective effort to learn valuable life and interpersonal skills. Bradley Tech has had a number of dedicated mentors, such as Steve Hopkins and Jim Moritz, who work with the team every Tuesday after school. This year the mentor team includes Anthony McHenry, a 2015 Bradley Tech graduate, who enjoyed the program enough to return and assist the student team this year. Many other past members regularly visit and share the learning and team-building creativity value of participating in past builds. 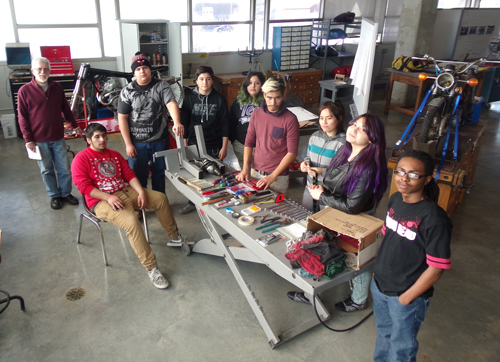 Tech’s renovated shop now serves as the school’s Design & Build Studio for big student projects that include the Build Motorcycle Club. The Build Club is partially sponsored by the generosity of PPG Industries. Markel, a sponsor or Build, awards two scholarships to Tech students in 2012.